The Defender Oath | Make and Honor Your Commitments to Your Republic! 5. Libraries Online — Links to online library catalogs and collections. 6. Primary Sources — Extensive collection of links and documents from Rick Gardiner's site. 7. Religious Scriptures Online — Links to the writings of the world's major religions. 8. Prime Reading — Recommended reading. 1. Bouvier Law Dictionary. Also available as two self-extracting executables: Part 1 and Part 2, or two zip files: Part 1 and Part 2. 2. Black's Law Dictionary, 2nd Ed. 1910. 291.8MB. 3. Wikipedia Articles of Interest. Check these for fidelity to their subjects. 4. Legal Dictionary — One of the FreeDictionary collection. 5. Legal Dictionaries Free and Online — Collection of links. 6. law.com Dictionary — Find definitions of legal terms. 7. The Language Bin: On-line Dictionary — Single query form searches multiple online dictionaries. 8. Dictionary.net — Gateway to multiple online dictionaries. 9. The Century Dictionary — Most comprehensive of the online dictionaries, with more than 500,000 words. 10. Merriam-Webster Unabridged Dictionary — Online edition of their printed dictionary. 11. Online Dictionary from Datasegment.com — Makes use of multiple print dictionaries. 12. Ahoi! — Online dictionaries & online translation. 13. Your Dictionary — Combines dictionary and thesaurus functions. 14. Webster Dictionary — Another online dictionary. 15. Dictionary of Difficult Words — Focus on words that are obscure or difficult to define. 16. Hypertext Webster Interface — This has a mirror site. 17. HyperDictionary — Interesting implementation, worthy of a visit. 18. 1913 Webster's Revised Unabridged Dictionary — From the U. of Chicago ARTFL Project. 19. Roget's Thesaurus — Online reference of synonyms and related words. 20. Encyclopedia Britannica — Another way to access the online edition of this important reference. 21. Encyclopedia Britannica, 11th Edition — Complete online version of the last public domain edition, and arguably one of the best. 22. Grolier Multimedia Encyclopedia Online — Usage charge on this standard reference. 23. World Book Online — Usage charge on this encylopedia, mainly directed at younger scholars. 24. Encyclopedia.com — Usage charge on this encylopedia, but has many short articles that are free. 25. The Encyclopedia Mythica — Compendium of mythology, legends, and folklore. 26. RefDesk.com — Links to all kinds of reference sites and pages. 27. ReferenceDesk.org — Links to all kinds of reference sites and pages. 28. Librarians' Index to the Internet — Large searchable link collection oriented toward library research. 29. Research Libraries Group — System for sharing of resources among libraries. 30. ProQuest — Formerly University Microfilms. Source for documents on microfilm and microfiche. 31. English-Greek, Greek-English Online Dictionary — Find Greek terms for English words. 32. 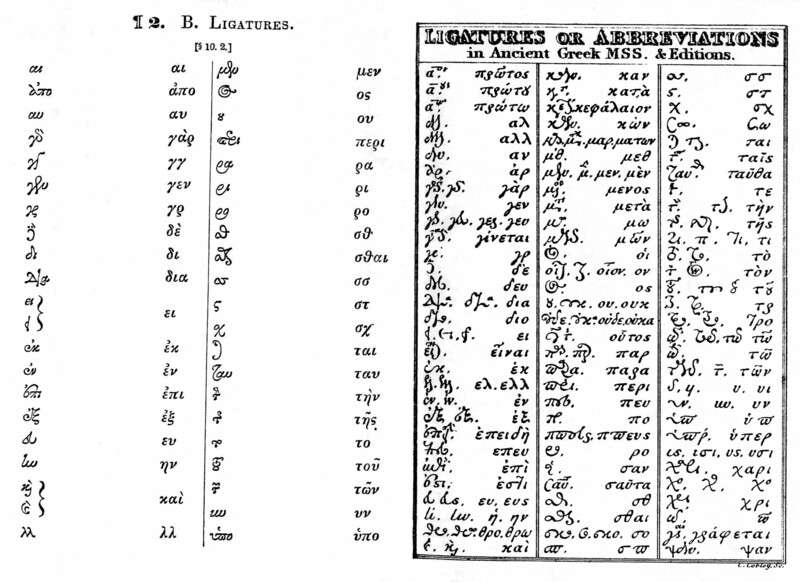 Greek Ligatures — Tables of ancient and medieval character combinations and abbreviations, useful for rendering manuscripts into Greek fonts. 33. Latin Dictionary and Grammar Aid — Check the correctness of your Latin. 1. Robert's Rules of Order Revised — Online version of 1915 edition. Essential manual for parliamentarians of deliberative assemblies. The HTML files can also be downloaded all at once in a Zip archive for local use on your computer. o Translations — Collection of RROR in other languages. 2. Parliamentary Procedure — Links to resources on making decisions in deliberative assemblies. 3. The On-Line Books Page — Archive at the U. of Pennsylvania. 4. Evans Digital Edition — Plan to eventually put online images of every printed work from 1639 through 1800. 5. Hypertext on American History — From the colonial period to modern times. 6. History of Economics Services — E-texts on economics. 7. Center for the Study of the Great Ideas — From the editors of The Great Books of the Western World. 8. Index of Dictionaries on the WWW — Links to every known dictionary. 9. Questia — Large collection of online books, but only viewable one page at at time. 10. The Latin Library — The Latin classics in Latin. 11. Office of Population Research — Comprehensive data on population growth, distribution, and factors affecting birth and death statistics. 12. Intelligence & CounterIntelligence — Extensive collection of links on intelligence and counterintelligence matters. 1. The Annotated Constitution — GPO, CRS [ASCII, PDF], 2444p. Project of the Congressional Research Service (CRS) and Government Printing Office (GPO). Annotated references to Supreme Court decisions arranged by provision and amendment. Acrobat reader needed for PDF files can be downloaded from here. Some very large files. 2. The U.S. Constitution Annotated — Findlaw rendition. Links to case files on their site. 1. Annals of Congress — Record of debates 1789-1824, which offer the most insight into original understanding of the Constitution. 4. U.S. Statutes at Large, complete collection, 1789-2007, with selections for tax statutes of 1917-1939. 7. United States Code — Searchable tool provided by GPO. 8. Code of Federal Regulations (CFR) — Searchable tool provided by GPO. 9. GPO eCFR Search Engine — More powerful, beta version, may not return all results of a search on the Code of Federal Regulations (CFR). See Search Tips for instructions. 10. Office of the Law Revision Counsel, U.S. House of Representatives — These are the people who are restating the Statutes at Large (SAL) into the United States Code (USC), some of which have been re-enacted as statutes and some of which have not, so it requires some research to determine which are statutes and which are only "evidence" of the statutes. The USC is not to be confused with the Code of Federal Regulations (CFR), or with various government forms and instruction books, which are a product of the various executive branch agencies, allegedly based on the statutes or codes, but sometimes extending and deviating from them in significant ways. The application of provisions of the CFR to any but government employees or contractors, or to visitors to government facilities or users of government proprietary assets, is unconstitutional exercise of the legislative power by the executive branch agency. For more on this see the Borlase Guide. 11. Internal Revenue Code — 26 USC, as of January 1, 2002. 13. Uniform Code of Military Justice (UCMJ) — Local copy as of 1997 June 15. 14. US Supreme Court Cases & Opinions — Comprehensive free archive from justia.com. 15. FindLaw — Comprehensive archive of legal resources, including U.S. Supreme Court decisions. 16. Legal Information Institute — Cornell archive of legal resources, including U.S. Supreme Court decisions not included in the Findlaw collection. 1. Decisions by Justice — U.S. Supreme Court justices in alphabetical order, with links to the decisions they signed. 17. vLex — Comprehensive archive of legal resources, both U.S. and foreign. 18. Supreme Court of the United States — Rules and status of cases. 19. Oyez — Multimedia archive of the U.S. Supreme Court. 20. Federal Judicial Center — Collection of publications, such as litigation manuals. 21. Public Access to Court Electronic Records (PACER) — Electronic public access service that allows users to obtain case and docket information from Federal Appellate, District and Bankruptcy courts, and from the U.S. Party/Case Index. A small fee is charged for time or pages accessed. 22. U.S. Federal Circuit Courts — Starting with map of U.S. showing which states are in which circuit, at Georgetown U. School of Law, with links to decisions. 23. Landmark Supreme Court Decisions — Local archive, with commentaries on the rulings and the opinions. 24. USSC+ — Database of matters related to the U.S. Supreme Court. 25. United States Attorneys' Manual — Useful reading for anyone who may have to go against them. 26. Brief Reporter — Extensive online collection of legal briefs on many topics. 27. CaseStream — Information of federal cases, active and inactive, civil, criminal, and bankruptcy. 28. Avalon Project at Yale Law School — Documents in law, history and diplomacy. 29. The Founders' Constitution — Online documentation from the University of Chicago. 30. Bluebook: A Uniform System of Citation — Rules of typography and formatting of legal writings. They are planning an online edition. 31. MegaLaw — Extensive legal links and research tools. 32. Jurisdictionary® — Pre-trial tools. 33. Zimmerman's Research Guide — Legal research tools. 34. Directory of Pro Bono Programs — Provided by American Bar Association. 35. Big Class Action/Civil Rights — Contact service for pending and proposed class-actions. 36. Ancient Legal Sourcebook — Collection of documents and links at Fordham University. 37. Medieval Legal Sourcebook — Collection of documents and links at Fordham University. 38. Model Editions Partnership — Links to collections and standards for marking up online documents. 39. GovBot — Search engine for U.S. government sites and resources. 41. Internet Law Library — Now hosted by LawGuru. 42. Law & Politics — Extensive collection of links to resources of all kinds. 43. Winservices Legal Research Links — Directory and links to many legal references and other resources. 44. Rominger Legal — Links to all kinds of legal resources. 45. Substantive Law on the WWW — Randy Singer's collection of links to statutes and caselaw, federal, state, and international. 46. Georgia State University Law Index — Many links to online legal resources. 47. The 'Lectric Law Library — Great resource of legal reference materials for lawyers and laypersons. 1. How To Shepardize — Manual for finding cites to legal cases. 48. Federal Web Locator — Maintained by the Villanova Center for Information Law and Policy. 50. Official US Executive Branch Web Sites — Gateway to Executive Branch. 51. Federal Register — Proposed regulations posted here. 52. Regulations.gov — Gateway to the Administrative State. Start here to try to stop further usurpations. 53. National Archives and Records Adminstration — Archive of all kinds of interesting information, including the Federal Register and various images of important documents, such as the Charters of Freedom. 54. Congressional Record Online — So far only goes back to 1995. 55. National Constitution Center — Museum devoted to constitutional materials. 56. Government Information Awareness — Emerging site at MIT. 57. Bill of Rights Institute — Education resources on the subject. 58. Federal Judiciary — Clearinghouse of information on U.S. federal courts and news about them. 59. Federal Bureau of Investigation — Has status of popular cases. 60. Central Intelligence Agency — Archive of useful facts of all kinds. 61. Department of State — Archive of international news and policies. 62. U.S. Information Service — Used to be the USIA. Operates VoA. Much useful information. 63. Department of the Treasury — Archive of information about money. 1. Economic and trade sanctions against targeted foreign nations — Listing of those currently in force. 64. Internal Revenue Service — Tax info, but can you cite this in your defense if it's wrong? 65. Census Bureau — All their data available here. 66. Stat-USA — Huge databank of statistical data of all kinds. 68. Comprehensive Annual Financial Reports CAFRs) — In case you thought we live in a free enterprise economy. 71. Thomson's Compilation of the British Statutes in Force in the State of Florida — This mostly handwritten compilation is the most complete collection of British colonial laws. 72. Openlaw — An experiment in crafting legal argument in an open forum. 73. YouKnowItAll.com — Online Continuing Legal Education (CLE). Focus on Texas, but useful for lawyers and laypersons generally. 1. Thomas: Legislative Information on the Internet — U.S. House and Senate activity. 2. Congressional Directory — Members of U.S. Congress with contact information and committee membership. 3. U.S. House of Representatives Web page — Legislation, members, committees and organizations. 4. U.S. Senate Web Page — Legislation, members, committees and organizations. 6. Almanac of American Politics — Online version of this standard reference work. Contains information on members of the U.S. Congress and the states and districts they represent. 7. National Political Index — Comprehensive directory of all things political. 8. Congress Action — Provides up-to-date information on what is going on in Congress that may require citizen action. 12. Policy Experts — Directory of individuals and organizations published by the Heritage Foundation. 14. Republican Internet Directory — Archive of links to all kinds of sites related to the GOP and conservatism, including email addresses of national and state Republican elected officials. 15. National Budget Simulation — So you think it's so easy to balance the budget and reduce the national debt? This game lets you try your hand at it. 16. Krieble Institute USA — Conducts monthly conferences on political methods. Persons can interact via satellite or via the Internet with RealAudio. 1. American Memory Collection — A project of the Library of Congress. 2. Making of America — Collection of 19th century books and journals by Cornell University. 3. American Revival — Collection by Micha Petty. 4. Historical Text Archive — Collection by Don Mabry. 5. AmericanCivilWar.com — Particularly interesting for the constitutional issues raised. 6. Amistad Research Center — Documents the 1839 slave rebellion aboard a slave ship, capture of the rebels in the United States, and their trials, which led to an appeal before theU.S. Supreme Court, where they won their freedom and return passage to Africa. 2. Flags of the World — Flags of almost every country and state, many organizations. GIF files. 3. World Forum — Essays on globalist themes, but not much on constitutional legitimacy. 1. PBS/WGBH-TV/Frontline — Much documentary material on Waco. 2. C-SPAN — Coverage of constitutional processes and some issues. 1. UFO-related On-line Sites — If there is something to it, and it is being covered up, it affects everything, including constitutional issues. 1. FidoNet — Gateway to this interesting branch off the Internet. 2. Internet Conference Calendar — Find the conferences you can attend. Improve your financial fortunes with GetZooks! Subject: Re: regarding Teknosis article "Larry Becraft analyzes the legal bases of Mercier's Invisible Contracts"
It would help if people just first became familiar with some basics. that law, it is either misquoted or wrong. We need to focus on accuracy. Statutes at Large (huge files), and these files are word searchable. laws as well as links to State constitutions and Codes. > you have to do is look it up.” That sounds good, but LOOK IT UP WHERE? > simply disappeared, and nobody knows what happened to them. > the English law applicable today and I cannot find it. Now what? > prevent people from obtaining remedy. > from what it says? > remedies that they can. > cost so much that typical tax protestors haven’t the money to pay. > agent for that very reason, after trying to get him fired through TIGTA. > ordinary people the way they can do to lawyers. > legal bases of Mercier's Invisible Contracts"
> to expose to these unfortunates the road to the right, Liberty Road. > “legal” gurus and, being gullible, they fall for these arguments. > erstwhile educator being falsely accused of being a cop on Slavery Road. > movement is being labeled as quacks and freaks. > matter of nonsense legal arguments, this movement cannot be effective. > Contracts. Avoid the mire of patriot myths. Should we take advantage of the people's ignorance just because we can? When we cross the Constitutional line, do we not cease to be Peace Officers and become rogue agents in violation of our own oath? Does the end justify the means? What legacy do you want to leave your own children?